Dowdy Studio: Time to party - December 15th!!! Time to party - December 15th!!! 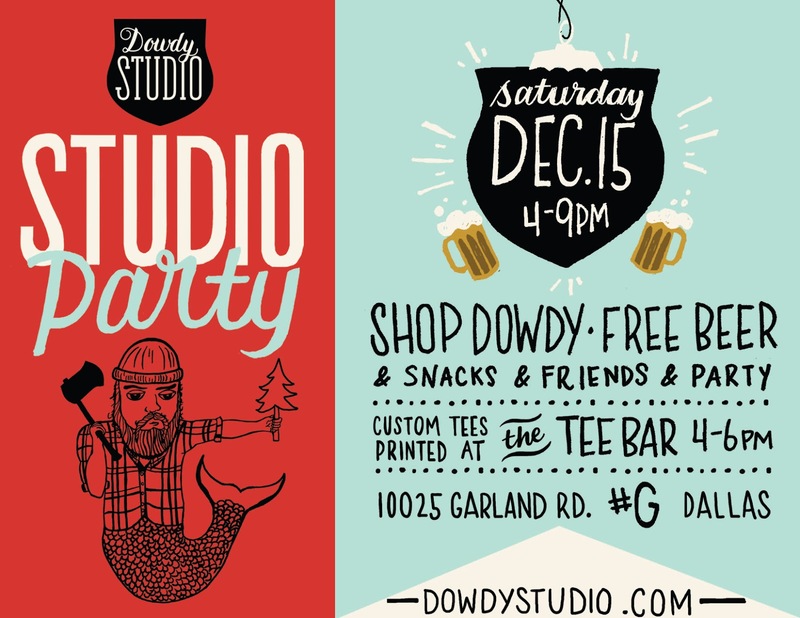 It's time for some merriment and cheer at Dowdy Studio's Studio, so we invite you to our holiday Studio Party!! 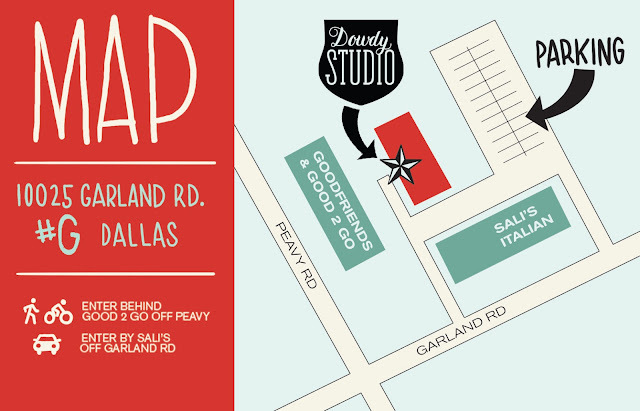 Bring your friends and let's celebrate the holidays Dowdy style in our studio on December 15th, from 4-9pm. Drinks and snacks are on us!! 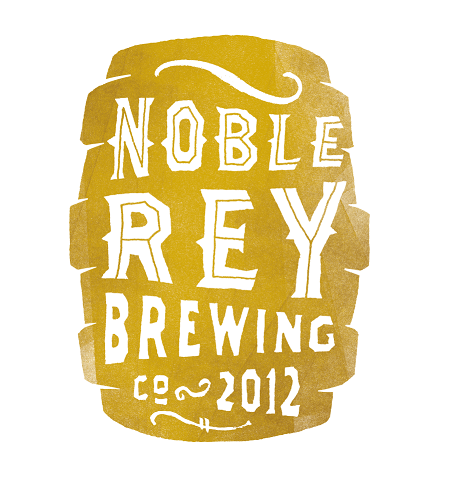 With a local brew from Noble Rey Brewing on tap and holiday spirits for the over 21'ers, drinks and holiday treats for all, it shall be a merry good time! Napkin Art Studio - Our awesome talented neighbor, Napkin Art Studios, will also be open and partying with us. Be sure to stop by and grab some of his screenprinted posters and holiday cards too!! TEE BAR IS BACK! - From 4-6pm we will have the Dowdy Studio TEE BAR open for anyone to come get their own custom Dowdy tee, tank or long sleeve made on the spot. Pic your favorite tee color and design from our selection, watch us print it on the spot, and take it home to wear or wrap up. MER-CHRISTMAS PHOTOS - Bring your camera/phones and snap a pic as you pose in the free Mer-Jack photo cut out. He's all decked out for the season and ready for your face! MERRY GIVEAWAY!! - Santa will not be making an appearance (that man is awfully busy and hard to book), but he will be gifting 5 lucky guests with their favorite Dowdy tee. Just stop in, find the Santa Dowdy giveaway, and enter to win your very own selected Dowdy t-shirt to be delivered by Christmas via Santa's sleigh...er the his elf in the postman's truck. We won't be awarding winners at the party, so you'll have to watch your doorstep to see if you won. PARKING - If driving to the party, please park behind Dowdy Studio in the designated lot, and not up against the other shops of the building. We welcome you to stay in the area after the party and grab some grub and drinks at Goodfriend's Beer Garden, but please remove all vehicles from our lot by 9pm and park in Goodfriend's lot to avoid towing. Big thanks to our friends at Noble Rey for bringing us some fine locally brewed beer. 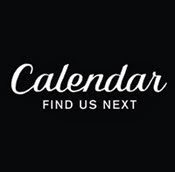 Do go to their new website and check them out!! Then come to the party and Be Noble, Drink Noble! Photo yo'self at the Girlie Show! !